Download these cheap ebooks for women directly to your laptop, iphone, or kindle and e-readers! Yes, we know you love cheap ebooks, but we appreciate your downloads! Because all sales of these cheap ebooks go to help fund HerAfter.com and spread the word about the site, so be sure to share the ebooks you like with friends to help us grow! Download these cheap ebooks for women directly to your laptop, iphone, or kindle and e-readers! 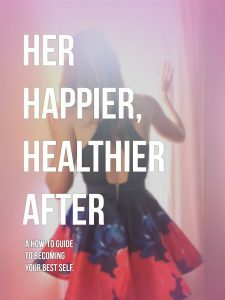 A simple guide to building happiness and self esteem by asking the right questions, prioritizing her best self, and consciously embracing beauty, style, wellness and healthy living. Full of important questions to ask yourself, simple guides and tips on everything from home decor to beauty and style to exercise and fitness, this short book offers a fun, inspiring new look at how women can live fulfilling lives by indulging in the activities they love most. Where does true beauty come from? Where does my personal power come from? This ambitious collection of essays is destined to inspire every woman to fall back in love with her self and her life. HerAfter Vol 1 is full of essays written to help you live fully, reach your potential, and create a beautifully conscious life. How Do I Deal with Emotional Baggage in Relationships? How Can I Be Happier In Life? Following up to the first collection, Volume 2 focuses on feeling beautiful, and building healthy relationships with yourself and others. Is It Possible to Enjoy My Period? More thought-provoking and soul-awakening than ever, HerAfter’s Volume 3 collection of inspiring stories will empower you to build confidence, appreciate your unique beauty, and truly embrace your potential physically and emotionally. Positive affirmations and mantras for happiness to help you create a happier, more peaceful and fulfilling life. 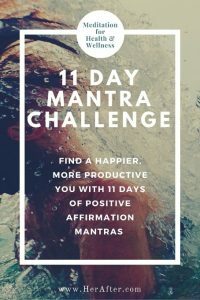 Whether you have a regular meditation practice, or simply want inspiring, motivational mantras to help you feel more mindful, content and peaceful, this series will help you. It has appeared on Huffington Post, Yahoo!, SheKnows, YourTango, and many more sites, and continues to be the author’s most popular article. New ebooks come out quarterly based on articles. If you’d like more ebooks and freebies from HerAfter, let us know in your comments below! And be sure to leave reviews on Amazon for us, to let us know your favorite ebooks from the site and help more people find our work!